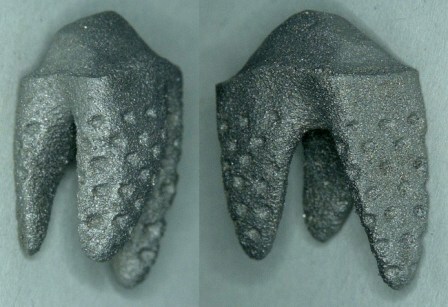 German firm Natural Dental Implants (NDI) has developed a 3D printed version of the Replicate tooth. The new 3D printed tooth will also feature titanium root portion and zirconia abutment portion similar to the already available Replicate tooth that is made by 5-axis CNC milling. Replicate system includes titanium-zirconia tooth and customized cover called shield Replicate temporary protective crown to assist the tooth during the healing process. According to the company, the Replicate tooth is an immediate and minimally invasive alternative to traditional dental implants and three-unit bridges. Replicate tooth is an anatomical copy of the patient's natural tooth, which occupies the space of the tooth being removed. Designed individually, the Replicate tooth component can be modified to minimize anatomical limitations or meet specific clinical requirements. The Replicate tooth development will start with the DVT/CBCT scan and dental impression process. Based on the data submitted by dentist, the company will design and manufacture Replicate tooth for the specific patient. The Replicate system is already marketed in the European Union, while it is yet to receive approval from the US Food and Drug Administration. Natural Dental Implants CEO Ruedger Rubbert said: “Our patent portfolio includes endossoeus and perio-integrative implementations, various surface enhancements, CAD/CAM systems, and manufacturing technologies, utilized in rapid prototyping methods and 3D printing. "Using new technologies like 3D printing helps us reduce costs and provide even more value to our customers." Image: The 3D printed Replicate tooth. Photo: courtesy of PRNewsFoto / Natural Dental Implants AG.